Marshall Headphones Major III Bluetooth is the next chapter in the revolutionary history of Marshall. This modern go-to classic has been re-engineered for a cleaner more refined design, while the silhouette stays true to its original form. Major III Bluetooth offers you the freedom and convenience of wireless bluetooth aptx technology and 30+ hours of playtime on a single charge. Sticking to the basics, the major iii is covered in time tested durable vinyl covering and proudly stamped with the iconic script logo, all giving a firm nod to the legacy of Marshall. Connect wirelessly to Marshall Headphones Major III Bluetooth with Bluetooth aptX technology. Not only does Bluetooth aptX play music at a higher bitrate, but it also minimises audio/video-syncing issues, allowing you to watch movies with perfect lip sync. This also gives you the freedom and convenience to move with 30 feet of wireless listening range. 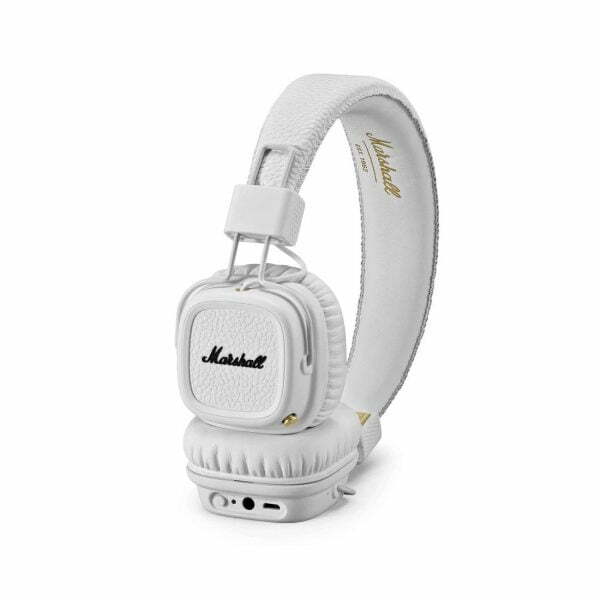 Marshall Headphones Major III Bluetooth is a modern classic re-engineered with a straight fit headband, slimmed down 3D hinges and rebuilt ear cushions. While thicker loop wires with reinforced rubber dampers that contribute to the overall solid build quality. With its collapsible design, Major III Bluetooth is the ultimate travelling companion, able to withstand long days on the road. Major III Bluetooth features black anodised 3D hinges that rotate freely to adapt to your head for an ergonomic fit. No matter how hard and heavy the music, the super soft ear cushions will rest lightly upon your ears.